Hey, this is Chris Miller and John Mundy. 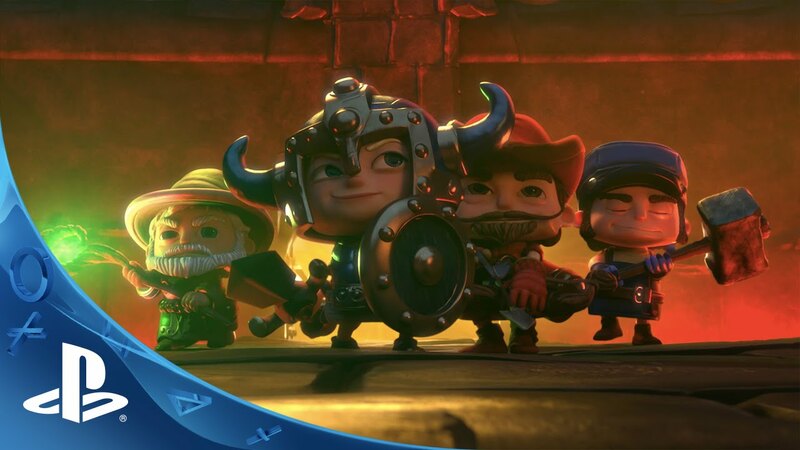 We’re the studio head and creative director of Fun Bits Interactive, and we’re here at Sony’s PlayStation Experience in Las Vegas to announce our latest game, Fat Princess Adventures. 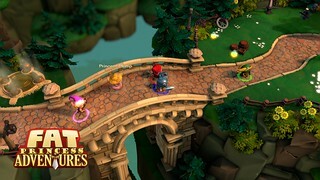 This new Fat Princess is bigger and badder than ever, with tons of fast-paced hack ‘n’ slash action. Up to four players can play together online or on the couch to save the world in this casual co-op RPG adventure. 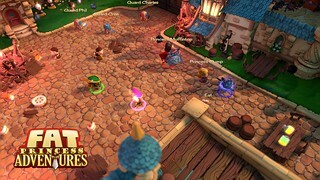 The warring kingdoms from the original game have signed a truce and joined forces to battle the Bitter Queen and her army of hungry Gobblings. Your epic quest will span the length and breadth of the land of Great Bitten, from the pinnacles of the Salt Mountains to the depths of the Mines of S’morsia. 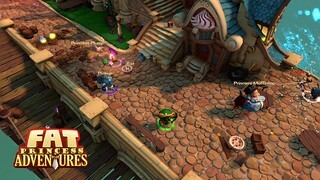 Along the way you’ll fight dozens of new enemy types ranging from sticky cake golems to dreaded pirates. Fans of the original game will instantly recognize the classic character classes: the Warrior, the Archer, the Mage, and the Engineer. This time however you can upgrade your character with new armor, weapons, spells and other accessories. Each class also has a suite of sweet new combat moves, including an Awesome Sauce ability that temporarily transforms you into a cake-fueled engine of earth-shaking destruction. Just like in the original game, switching between character classes is as easy as switching the hat you’re wearing. The princesses are back as well. Although they still need you to rescue them from time to time, now they can also fight alongside you, using their rainbow magic to tip the tide of battle in your favor. It’s a good thing too, because you’ll need all the help you can get to defeat the Bitter Queen and keep the world tasty and sweet. All of us at Fun Bits are excited to be working on Fat Princess again, and excited to be collaborating with the original FP production team at Sony Santa Monica. We’re working hard to give you a new Fat Princess that remains true to the character, charm, chaos, and irreverence of the original. We hope you enjoy this brief taste of what we’ve been cooking up, and we’re looking forward to sharing more details about Fat Princess Adventures in coming weeks. Stay tuned to the PlayStation Blog for more info and cake! It looks awesome, I’m excited and day one for me. I wouldn’t mind seeing a port of the PS3 game to PS4 too ;) I’m looking forward to this. Looks really great, loved the original!! Hope we see the first game’s multiplayer vs. mode updated and included in the new title. I really hope I am reading this wrong and you guys didn’t take one of the best multiplayer experiences on the PS3 and turn it into a 4 player co-op rpg. What a massive massive disappointment if this game does not feature the classic multiplayer of the original. It feels like you guys looked at what players wanted and said to heck with that. Sad stuff. At least port the original over so folks can actually enjoy an actual interesting game. Please say the classic online multiplayer mayhem is there and that this game isn’t a discount diablo instead. I cringed during the reveal. 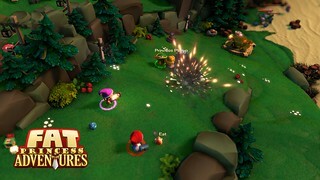 I pray that it still has the multiplayer arena style V.S modes, there has never been more excitement and screaming on my couch from four people than when Fat Princess is being played. Cake is life, princess is fat, adventure is real!!! Anything on if the game can be played in 3D on our 3D HDTV’s? @6: This isn’t Fat Princess 2. It’s Fat Princess “ADVENTURES”. It’s fitting. The IP is experimenting with new ideas ,and I’m all for it because I love the IP. I would love a true sequel, but I’ll take these new types of games based in the Fat Princess world too. Dude Fat Princess is one of the best multiplayer games of all time. Don’t turn it into a co-op RPG, what the hell. Please say this has similar MP with base building and resource gathering? Couch COOP experience with my son? Yup, I’m in! This is absolutely awesome, I can speak for the people over on cakelair(dot)net that this is what we’ve been waiting for for quite some time! By the way, what happened to Fat Princess: Piece of Cake on the Vita?! i’m very excited as fat princess was one of my favorite ps3 games. i actually really like that there will be a co-op story mode but i do hope that doesn’t mean no multiplayer. even if all you do is port the original fatprincess into this game i would really like to see the multiplayer on ps4. day-1 regardless though. I loved fat princess, I am very excited! I only can buy it on Vita. IM IMPRESSED…AND SURPRISED AS WELL. NOW PLEASE GET TO WORK ON SOME REALLY GOOD EXCLUSIVE GAMES LIKE STARHAWK .MOTORSTORM..GOD OF WAR…DEMOLITION DURBEY..OR A NEW 3RD PERSON MILITARY SHOOTER LIKE SOCOM ..JACK AND DATER..AND RATCHET AND CLANK. I HOPE THE MOVIE DOES WELL. SO YEAH..KEEP UP THE GOOD WORK SONY ..BUT DONT FORGET ABOUT THE GAMES THAT MADE THE FRANCHISE NOT ONLY POPULAR BUT NECESSARY ^____^. I don’t want a Gauntlet rip-off. I want Fat Princess 2. Or at the very least a port of the original. I’ve been waiting to hear about a new Fat Princess game from Fun Bits. It was definitely something y’all just had to do. Thank you! Excited to see a sequel, but miss the old way of playing in the first game. Really pumped to see this show up yesterday, but then immediately concerned. No one asked for this. People want an upgraded version of the original, a direct sequel. There are plenty of games just like this already out and not many FP type games…..this makes no sense. I hope you guys have the classic FP multiplayer up your sleeves and you are just playing hard to get. If you don’t then just go back to the drawing board. At least port the original over if this isn’t going to give the fans what they want. This is the kind of project that comes after a sequel is made and your trying to be fresh. FP was already fresh and fun before you changed it. I would be lying if I said I would skip this either way, but seriously, what were you thinking? wheres my preist and my multiplayer? Never played the 1st one…saw in sales a lot of times but game never picked my interest,actually its probably the only exclusive that dont have my interested.Release a demo please. Look at all these people who want you to put the PVP modes into the game too! Is it fair to describe Fat Princess as a MOBA? Bring one of the most unique multiplayer experiences to PS4. If you have to make it DLC! Surely there’s a reasonable price point to take content you’ve already built and put it into a game built with the new engine! At least get the game on sale cheap so we can get our friends to buy it or buy it for them! Wasn’t a big fan of Fat Princess on ps3. Know this going to be more adventure like I might give this a try. a fat princess withou pvp ? Burn in hell santa monica studio ! why u du that ? we all love fat princess for the great pvp , so why u turn it in a co-op rpg ?? realy , i´m so angry about that , we have so many co op dungeon crawlers but only ONE fat princess !! Physical release on port needs to happen, limited or otherwise. Nintendo didn’t give up on wii U, don’t give up on PSP2. Start listening, SONY. awesome! it would be better if its on the psvita too. I was REALLY hoping for another FP moba, but a gauntlet clone is fine too. I’ll more than likely buy it. I loved Fat Princess and still do. Might get FP Advenure. But I KNOW I would also LOVE and get a port of the original Fat Princess for the PS4. I enjoyed playing it so much I made it a present for a few of my friends and family member so we could play together. Haven’t had a chance to really play it since I am on the PS4. Made some really good friends from FP. Ah, the nostalgia. Anyway, I think this is the BEST time to release a FP port especially since there aren’t that many games out there on the PS4. So much multiplayer goodness in Fat Princess. So much resources to gather.